I’ve been thinking a lot about Work Environments since ARCHICAD 19 was released. Back in 2012, Yanni Alexakis, Product Manager at GRAPHISOFT, created and shared what he called the Principal Work Environment. The concept was simple: a minimalistic Work Environment that your boss could use. If your boss is dabbling in ARCHICAD, he or she doesn’t need access to ever feature. In fact, you probably want to remove the temptation of using certain features. 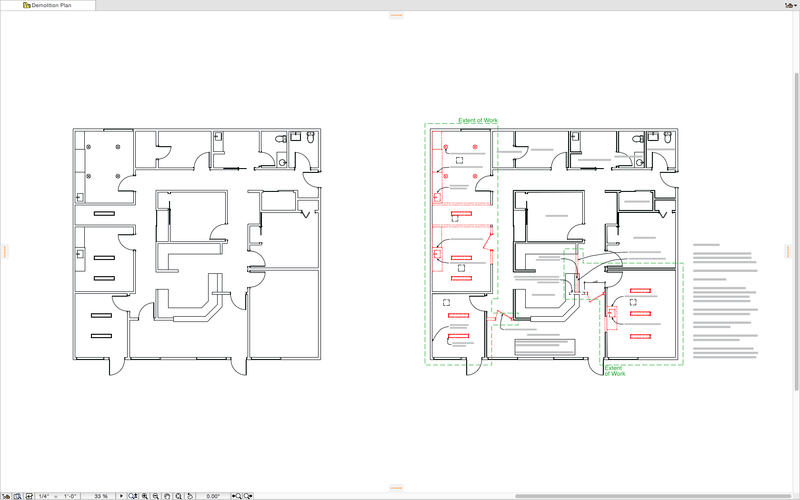 The last thing you want is to have your boss mucking with the IFC Manager if he is new to ARCHICAD. If you click on this link, you’ll be taken to a post I wrote about Yanni’s WE. Usually I say go read it, but whatever. Your choice. What’s important about that post, and Yanni’s minimal Work Environment, is that it’s a good reminder of how much you can strip away. 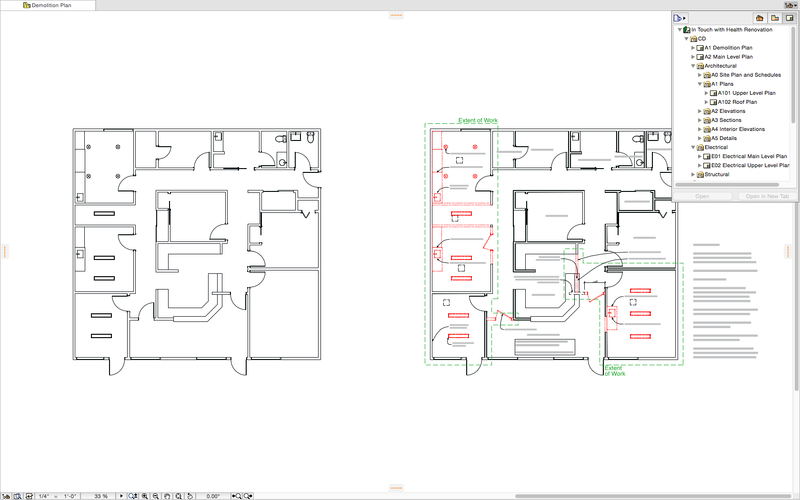 ARCHICAD is amazingly customizable, and we have extreme latitude to reconfigure how it is laid out. Instead of clicking over to look at how little Yanni was showing in 2012, here’s a quick mock-up of a slim Work Environment in 2015: For this Work Environment I turned off all but three menus, the Info Box, and one custom Toolbar that has only one buttom: a drop down list of Tools that usually show up under the Design/Design Tools menu. Had I put more time into it, I could have included all the Tools in the drop down list, and made the name shorter. Or hid the name all together and just made it a down arrow. Just because there always have been a bunch of menus at the top of the screen doesn’t mean there always needs to be a bunch of menus at the top of the screen. As with many of the things I write about, this sort of customization is excessive. 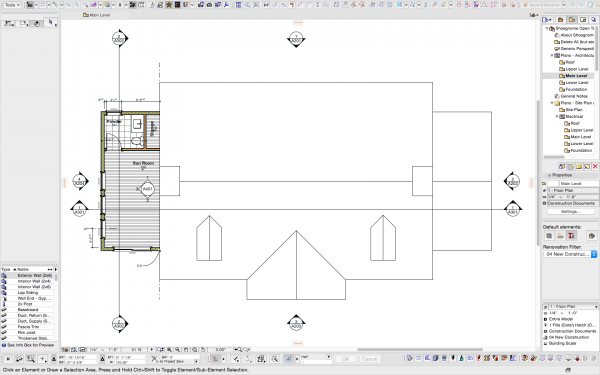 When looking at customizing ARCHICAD for maximum performance, one needs to think about how long it takes to create the customization, how much time the customization saves you, and how burdensome the maintenance of the customization is. Do not neglect maintenance as a key determinant in whether a particular change (to a Work Environment or Template) is wise. If you are in an office of ten people and create a hyper customized Work Environment for everyone to use, you not only need to update that WE across all those machines, you also have to train people how to use that Work Environment, continuously update it based on new features in ARCHICAD and improved work flows… My advice is to focus on precise and targeted tweaks. It’s cool to remove all the menus, but that’s not really helping. Likewise if you do your best to use the standard keyboard shortcuts, then when you talk about how to use ARCHICAD, odds are that the keyboard shortcuts you use are available to whomever you are talking to. Often our customizations are just solving problems that always had a better solution. Or problems that gained solutions while we weren’t looking. 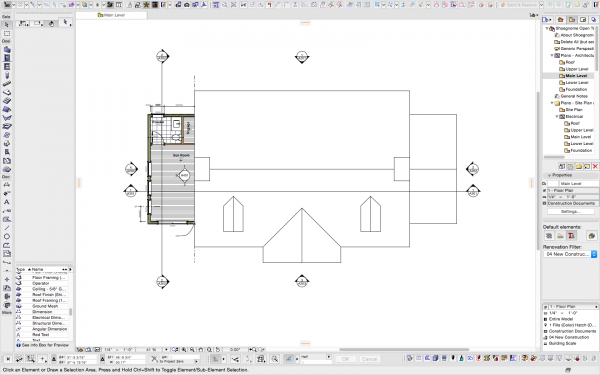 This is an issue we all struggle with, and it gets worse the longer we use ARCHICAD. If you’ve been using ARCHICAD for a decade or more, you are absolutely using clever techniques to solve old problems that no longer exist. But you still use those methods because they are comfortable and safe. Unfortunately however amazing they were when discovered, they are no longer clever solutions but unnecessary customizations. A clean Work Environment is a benefit to daily working. 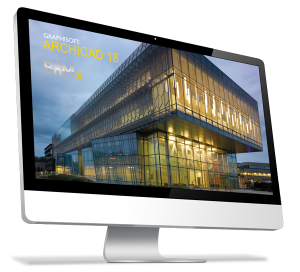 But a maximized Work Environment is not something we necessarily need to build, because ARCHICAD 19 has two new features which are much better solutions. 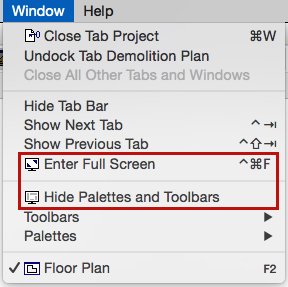 In ARCHICAD 19 we can hide all the palettes and toolbars and also enter full screen mode. My above customizations are geared towards two goals: more space to work and less clutter. 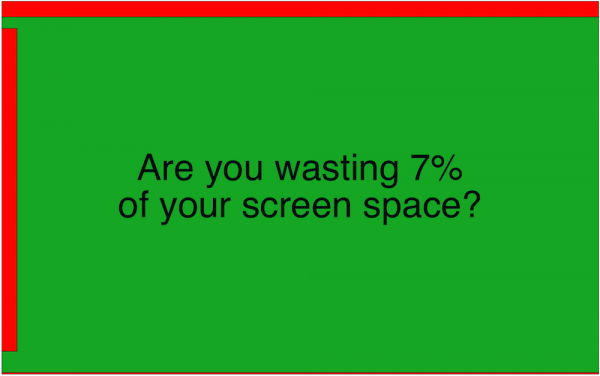 Less clutter is especially valuable when the focus is on presentation rather project development. You might be sitting at your desk with a boss or bringing your laptop to a meeting. 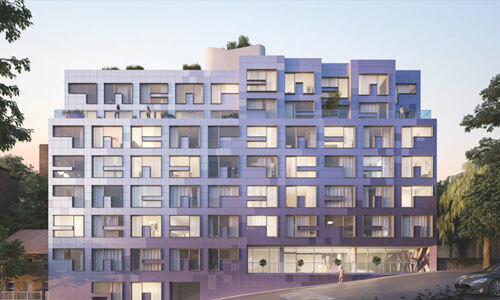 In those instances you want a temporary, non-destructive solution to presenting an ARCHICAD model in a non-distracting environment. By going to Full Screen and hiding all the Palettes and Toolbars, you get a blank screen; you get the benefits of paper without printing. In the image below, I have two plans laid out next to each other. There are no distractions, just an existing conditions plan and a demolition plan. It’s as close as ARCHICAD can currently come to being invisible. Hiding all the palettes, whether or not you also go to full screen, is made even more powerful because of the mini navigator in the top right hand corner (which is always available as part of the Tab Bar). This little feature turns hiding everything with an on/off switch from a parlor trick to powerful. 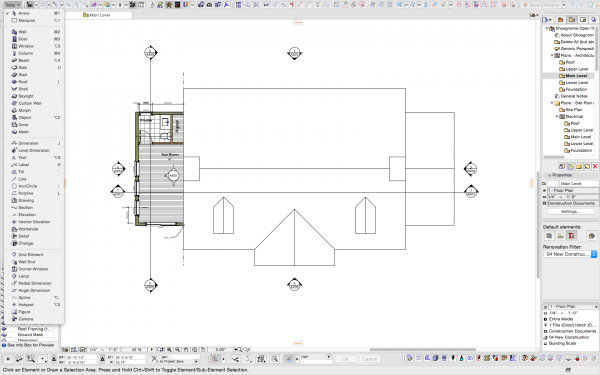 Because the entire structure of the file is still easily accessible from that icon, an ARCHICAD user can present the entire project from this mode. 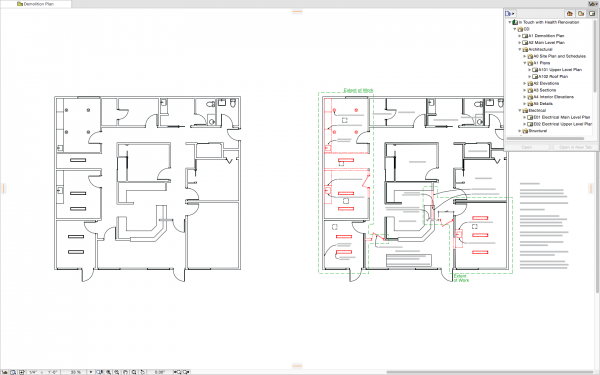 A project with a well structured View Map and Layout Book becomes magical to explore from the eyes of the non-user. Everything is there, behind the empty screen. There are no features turned off or inaccessible. They are just hidden. With keyboard shortcuts, everything is still reachable: Command+T for the settings of any element. ; Option+F2 for up a story; Command+F2 for down a story; other keyboard shortcuts for the various Tools, if you need to create new elements. You can actually go one step further and hide the Tab Bar in addition to hiding all the palettes and going full screen. But you don’t want to do that as navigation becomes impractically hard. You lose the ability to switch between tabs and the Mini Navigator disappears. Try it out. You will feel disoriented. 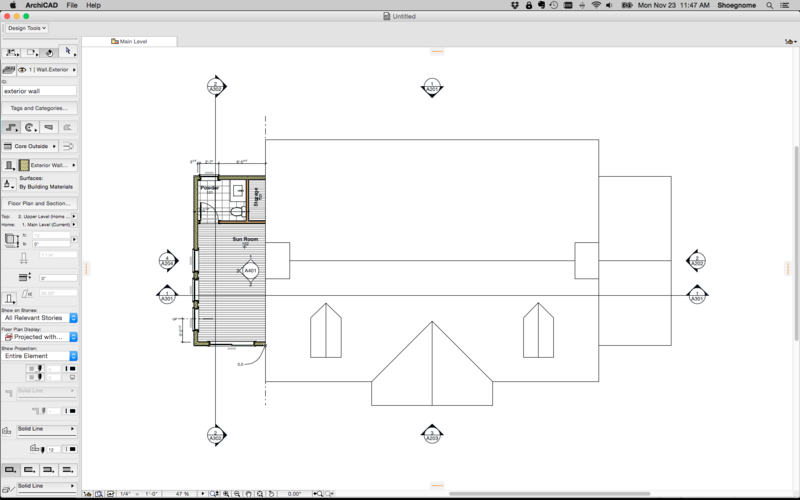 I suppose in extreme cases—like using ARCHICAD for walk throughs instead of BIMx—it might be useful to have 98% of the screen to be the view, but just like extreme customization, there is a limit past which UI simplification stops adding value. With UI alterations less is more only to a point. Now here’s the same Work Environment in Full Screen mode. It might not feel like much of a difference, but going to Full Screen adds 5% more space on my late 2011 Macbook Pro. That’s a pretty convincing reason to work in Full Screen mode, even before considering how Full Screen makes your computer less distracting—and we all need to make our computers less distracting. Or at least those of us who work from home desperately need help in the attention focusing realm. Going to Full Screen is an easy change. There’s really no drawbacks, especially if you memorize the keyboard shortcut (default is CTRL+CMD+F on a Mac). The other change I’ve made is perhaps more controversial, and depending on how you work saves less space, but I think it’s also a must. 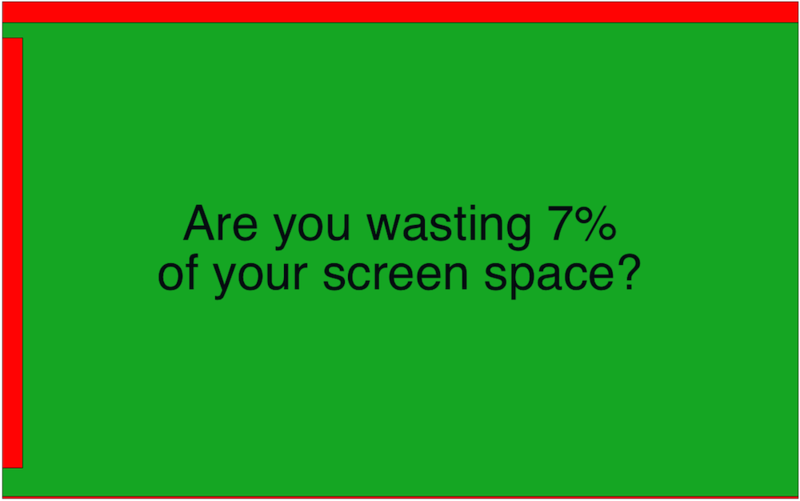 The Toolbox is a waste of screen space. Getting rid of it started off as a bit of a joke that was a fun opener to this post. But once you accept it as something that’s legitimately doable, it’s hard to argue against. Staring at the Tool Box all day was eating up another 2% of my work space. If I had been using the default OOTB Work Environment which shows the Tool icon and name, I would have been wasting 5% of my screen. All my Tools are now in a simple drop down menu. I had to create both a new menu and a new toolbar that referenced that menu. Fortunately if you like this idea (which you should), you don’t need to reproduce the work I did to write this article. 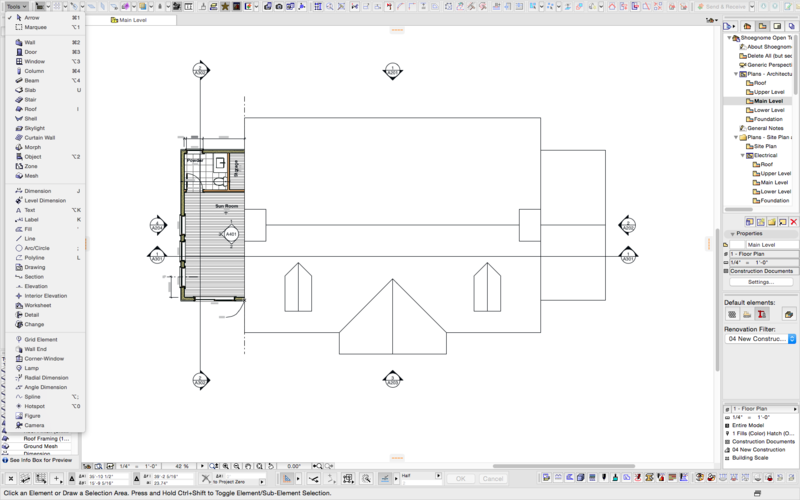 You can download my Work Environment for ARCHICAD 19 and use it, or take the parts you like (such as the menu and Toolbar I made). This new Toolbar covers the Info Box when it’s open, but that’s okay. I don’t need to see both. And when the Tool menu closes, my eyes are already looking at the Info Box, which is typically the step after selecting a Tool. This menu also reinforces my views that if you see it, you’ll use it. Next to each Tool icon is the name and the shortcut. I expect over time that I’ll use the drop down less and less as I better memorize my own shortcuts—and am reminded of them each time I use the drop down instead of the shortcut. Furthermore, I’m sure that as I rely more on the drop down, I’ll become aware of any shortcuts that I need to add. I don’t think I really need more, but maybe there’s one in the list that deserves it’s own. Beyond all that, decreasing the prominence of the Toolbox is another reminder that an important goal of BIM is data management, not just creation. I want to spend more of my time adding value to my data and elements, not mindlessly creating more and more. You can change your Work Environment in ARCHICAD 19 right now and gain 2-10% screen space, depending on what your Tool Box looks like and whether you are using Full Screen or not. That is insane. Your computer might become 10% bigger because you read this article. Make this change. Don’t ignore my advice because of how you did things in the past. We can all make changes. And these are easy changes with fantastic benefits: free space. 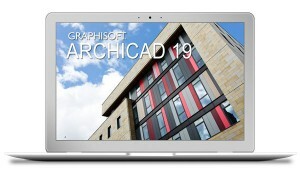 Am I alone in thinking that ARCHICAD needs a facelift? 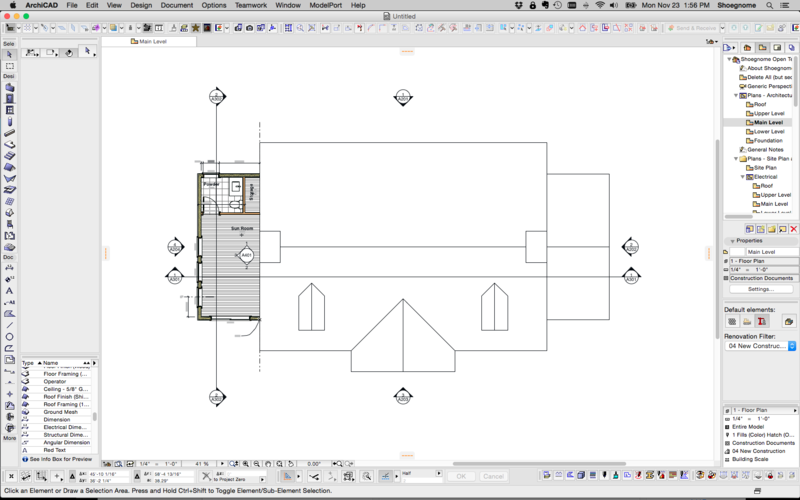 This post is helpful for re-capturing screen space, but generally speaking the ARCHICAD interface is glaringly dated and frankly ugly. The icons are pixelated and hard to decipher. 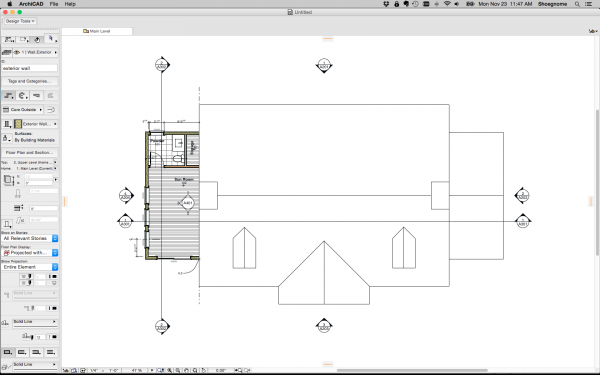 As architects we should expect a more beautiful design software experience. There have been continuous tweaks to the UI over the years, with a big one being the introduction of tabs and docked palettes with ARCHICAD 19. 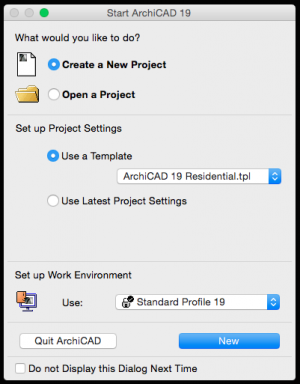 If you get a chance, look at ARCHICAD 9 or 11 or 15 next to ARCHICAD 19. It’s a surprising difference. But you are right, it has been a long time since we got a huge graphic overhaul.